Set on its own private island, Marsa Malaz Kempinski The Pearl, Doha makes for an exhilarating escape from the UAE. Where: Set on its own private island, Marsa Malaz Kempinski The Pearl, Doha makes for an exhilarating escape from the UAE. As we entered the awe-inducing lobby, with mosaics embellishing many of the walls and plant pots, beautiful sculptures at every corner and exquisite chandeliers and lights adorning the ceilings, it was clear to see that this was going to be a decadent experience. 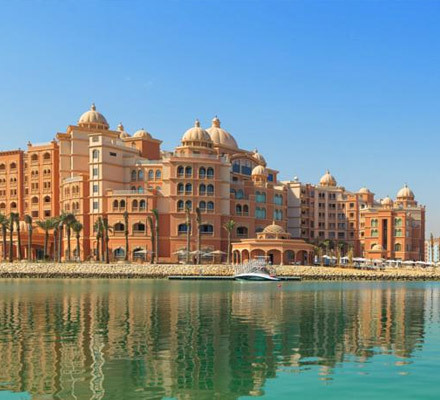 Marsa Malaz Kempinski opened this year and is the only licensed hotel on the island, making it a popular hotspot for tourists and locals alike looking for fine dining and an entertaining evening. Our Grand Deluxe Room – inclusive of 24-hour butler service – was a vast space that featured an office and lounge, an expansive balcony boasting views of the sea and pools below, along with a vanity area and lavish bathroom. Facilities & amenities: Enjoy swimming in several of the swimming pools at the resort or take a stroll along the private beach, before a luxurious pamper session at the first Spa by Clarins in Doha. The hotel also has a health club, tennis courts, water sports and even a bouncy castle for the little ones. What we ate: We were astonished at the number of international and homegrown outlets at Marsa Malaz Kempinski, featuring almost every cuisine imaginable. Brunch at Sawa is curated by executive chef Mattias Roock and serves international fare at live-cooking and buffet stations – a must-try if you’re in Doha for a weekend. We also delighted in an authentic Spanish spread at El Faro, whipped up for us by the restaurant’s super-talented head chef Raúl Cob, where we sampled starters of, an assortment (seafood, chicken and vegetarian) of incredible paellas and desserts including the naughty-but-divine churros, all paired with spectacular sangria. Our final meal at the hotel was at the enchanting Al Sufra, a restaurant with turquoise accents, fountains and carved-wood furnishings. We were treated to a feast of Levant cuisine where we tucked into cold and hot mezze such as Basterma cheese roll (moreish fried rolls of cheesy goodness), stuffed vine leaves and other speciality dishes, before being served Chicken Makloubeh – a traditional meal of layered rice, chicken, cauliflower and potatoes – and Hammour in a clay pot, which was cooked to perfection. Leave space for dessert, where you can enjoy refreshing delicacies both from the menu and the fresh Arabic pastry counter. Post-dinner drinks were also enjoyed at Toro Toro and Nozomi – we’d highly recommend popping in, even just for bar bites and cocktails. Best for: A decadent, gastronomic getaway for food-enthusiasts. If you want to go:From Dhs1,050 per night. Call +974-40355555 | E-mail reservations.marsamalaz@kempinski.com.